Here I am at the demo table for Sparkle n Sprinkle at the expo. It was alot of fun and I really enjoyed it. 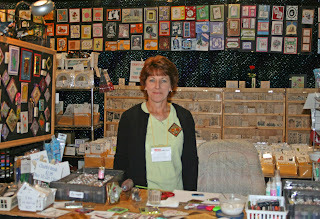 So much I am going to be doing demos at the Stampfest show next weekend in Orlando!! So come up and see me. My friend Sherree is coming too! What could be better than being surronded by all that rubber! There was alot of work in setting up, but her booth looks great when we are done! Thank goodness everything has wheels! But when you unload 200+ embossing powders and 80+ glitters, and 1800 stamps that alot to pack up!! This is a card I made before I left last week. 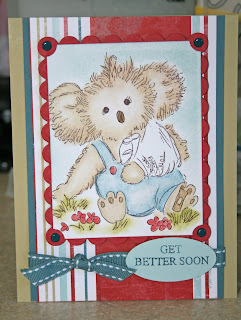 I've needed alot of get well cards lately. This is Casey from Sparkle n Sprinkle. It currently is retired, but I am trying to bring him back. So if you like this image and would like one please let me know. There are other images of Casey also, with balloons, fishing, with a football and a baby one. If you'd like to see them let me know. First I picked out the paper I wanted to use: Western Sky, then I had the colors to use. I stamped Casey with Brillance Black and colored him with my Prismacolors and gamsol, he is layered on Ruby Red using my Nestibilities. I attached Not Quite Navy brads and Blue Bayou stitched ribbon. The cardbase is River Rock. Thanks for looking. Stay tuned for some more exciting news coming in the next couple of weeks.